This is a block for quotes. And you can quote me on that. This is the list block. I should write what I have been doing lately. Did I tell you that I want to be a superstAR? My book about Ipoh, on Amazon. Lotus Mountain is about a robot and the man who broke her heart. The 360 VR short film written by Stephen Black and co-directed by Leo Wei and Stephen Black, is currently in postproduction. Lotus Mountain features Alps Bethneck, who can be seen in the 360VR film Beach Road, as well as The Changi Murals, a short film directed by Boo Jun Feng. The other stars of the film is the dynamic city of Shenzhen, the Silicon Valley of China. 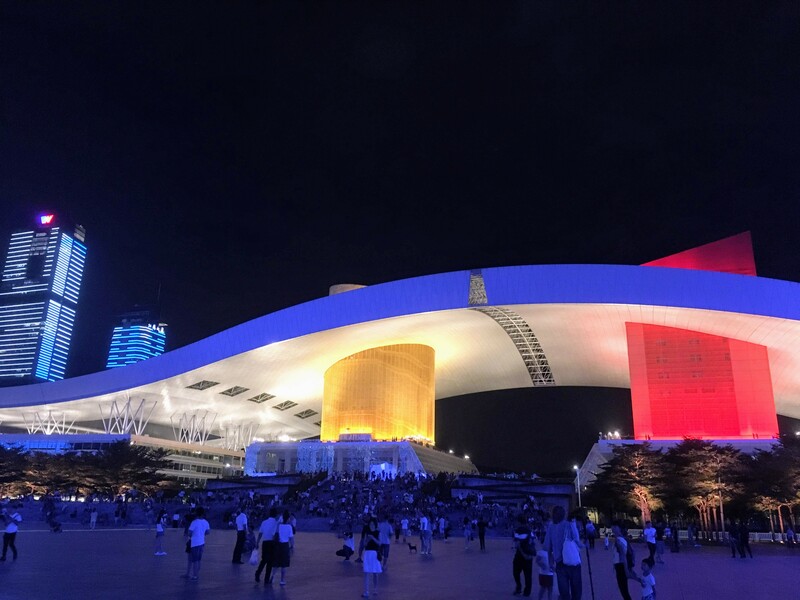 Shenzhen Civic Center at night. This page will be updated often in the next two weeks. The list of people we wish to thank is long, but for the moment, the producers would like to especially thank Stuart Rankin and the Dundercats/Six Cat Studios, Kandao 360 cameras, John Batten, Simon Carr, Ikram Choudhury, D Cafe, Angelo Costadimas/Bao Bao Films and the amazing teachers, administrators and students of the Multimedia & Entertainment Technology (MSc) Department of HK PolyU, especially Gino Yu, Dr. Ludovic Krundel and Giovanni Lion. Last but definitely not least, Lotus Mountain features the talents of bassist/composer/teacher Rei Shimizu and Scobot, the VR artist whose World One VR artwork has been attracting attention worldwide. scobot WORLD ONE SIFF2018 360 from scobot on Vimeo.